The Asia Pacific Region has a lot to offer to marketers all around the world. Although there is enough space for everybody to play in, the competition remains at the threshold and it’s a herculean task to get noticed in the heavily crowded market. What may come as an enabler to the marketers is having a strong repository of high-quality market intelligence, where Blue Mail Media can play an instrumental role. 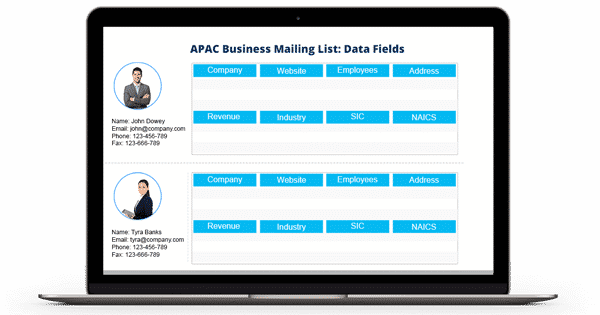 Our APAC Executives Email and Mailing List can give you access to complete marketing information to reach out to your target market via telephone, email or mail. Our APAC Business email database has over 5 Million contacts from all verticals and all departments. Business trade magazine subscriptions Etc..
Blue Mail Media has set high standards in serving clients with best in class APAC Business Email Database, which has helped clients achieve greater success in terms of their multi-channel marketing campaigns. Whether you wish to promote your offerings in Australia, Japan, Malaysia, Canada, Singapore, China, New Zealand, India or any other country in the APAC region, we have all the resources to serve you beyond your expectations. Also, we realize that your business is unique and a ‘One Size Fits All’ may not be the best option for you. Thus, apart from the pre-packaged APAC Business Mailing List that we offer, you may opt for a customized list based on your campaign specific strategies. Blue Mail Media has a well-established network of data partners across all major geographies such as USA, UK, Canada, Europe, Asia, North America, Australia and other countries. This enables us to serve you with competent APAC Business Executives Database in a global yet localized approach. Also, we have a knowledgeable team of data experts, researchers, and analysts that accumulate data from all the authentic sources, verify data at regular intervals and update the same to ensure its accuracy. Want to try our sample list? Call us today!